With a paint sprayer, large areas of a surface can be painted more quickly than would be possible using a roller. Along with the ability to paint much faster, a sprayer helps ensure that the area is covered completely. Sprayers can also be used to paint hard-to-reach areas. They also help ensure the coating or finish is even and smooth. One of the reasons that paint sprayers have become so popular is because they come in a wide range of power ranges, sizes and types. 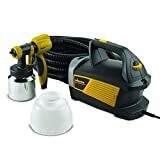 This HV5500 Spray Station from Earlex offers a highly effective and quick means of applying a wide range of oil-based and water-based coatings for both fine finishing and regular painting projects. Featuring HVLP technology, paint can be with precision and wastage is reduced, since control is maximized and overspray is minimized. It is also equipped with a durable 2 millimeters metal latex/stain tip. The EZ Tilt paint sprayer from Wagner makes it possible to complete staining projects in the least amount of time, no matter what the size. With this sprayer, paint can be sprayed from any angle. One of its innovative features includes the EZ Tilt flexible suction tube, so no matter how this sprayer is tilted or turned, the tube remains in the paint, making it impressively mobile and versatile. This Double Duty HVLP Paint Sprayer from Wagner is capable of providing continuous spray. In fact, it can spray up to 4.9 fluid ounces of paint per minute. 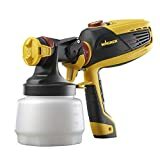 Its 2-stage air turbine has been rated for both indoor and outdoor use, so this paint sprayer ensures a fine finish, no matter what the setting. Its air cap can be adjusted to three different positions, namely horizontal fan, round spray pattern and vertical fan. This Control Spray Max HVLP Sprayer from Wagner provides a continuous spray by combining AC power and air press technology. 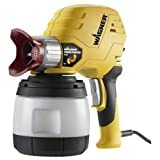 For paint jobs like refinishing cabinets and staining a deck, a professional finish can be obtained since this sprayer is equipped with a 2-stage air turbine. 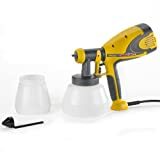 Thin paint finishes like lacquers, sealers, stains, urethanes and varnishes can be excellently applied using this sprayer. 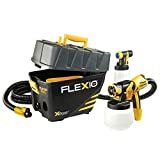 The Flexio 890 is a portable HVLP Paint Sprayer Station from Wagner that features integrated storage. It offers broad surface coverage thanks to its innovative iSpray nozzle, while its detail finish nozzle ensures fine finishing. 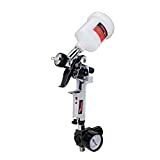 When using unthinned latex paint, this paint sprayer will take no more than 5 minutes to cover an area of 8 feet x 10 feet. The Flexio 590 from Wagner is a hand-held sprayer kit that is ideal for just about any project, whether indoor or outdoor. This paint sprayer is equipped with an X-Boost turbine that not provides unparalleled power, but also ensures full coverage and low overspray. Instead of one, the Flexio 590 features two nozzles, including an iSpray nozzle for a professional finish. 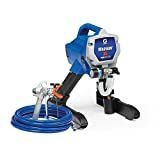 This Project Painter Plus from Graco is a paint sprayer from their DIY Series. This is means that it is equally ideal for absolute beginners, hobbyists and fixer-uppers, capable of providing spectacular results. Its pressure can be adjusted as desired, which means the paint flow can be controlled depending on the size of a project. Up to a 50-feet long paint hose can be attached to it and up to 50 gallons of paint can be sprayed per year through this sprayer. 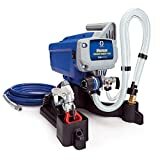 This Airless Paint Sprayer from the Graco Project Series is equally ideal for both handymen and homeowners. With this paint sprayer, anywhere from midsize to small paint jobs can be carried out quickly and skilfully. Depending on the project size, the paint flow can be controlled accordingly since the pressure is fully adjustable. This sprayer can spray paint from anywhere between a 1 and 5 gallon bucket. 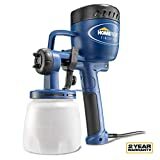 This Basic Gravity Feed HVLP Mini Air Spray Gun from PowRyte can be used for a variety of paint jobs, no matter how detailed or small, or even if they involve just touching-up. When using this sprayer, bounce back and overspray will be minimized, so a higher amount of paint will be transferred to the surface being painted. Three control knobs have been built into this sprayer, which make it quite precise and versatile. This Finish Max Fine Finish Sprayer from HomeRight is a high-volume and low-pressure paint sprayer. This means that it uses low-pressured air at a high volume, so paint can be applied with a professional looking finish. Overspray is minimized due to the low pressure. This means that the finish is directed wherever it is required. The spray patterns of this sprayer can also be adjusted using its precision control. Thus, it should be obvious that when using a paint sprayer, a painting project can be completed in half the time than it would take if brushes or rollers are used. Most indoor and outdoor painting projects, such as painting ceilings, decks, fences and sheds, can be performed using any of the above top best paint sprayers.